This session almost didn't happen. I am SO glad that it did. 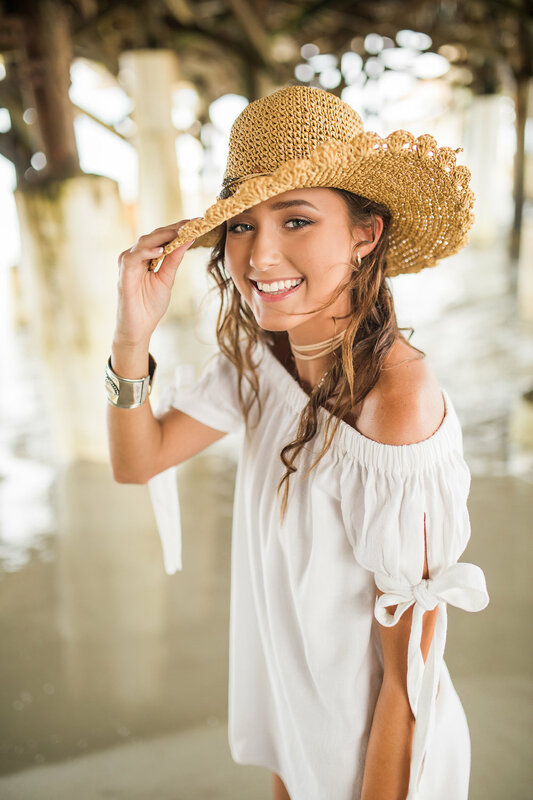 Maliah was visiting Cocoa Beach from her home in Michigan and this boho beach girl wanted her senior portraits to be different from all of her friends back home. We planned the perfect shoot on the beach during her brief stay. Unfortunately, tropical storm Emily had different plans and almost rained on our parade! Thankfully, just as the time for her sunset shoot arrived the rain stopped, the sun peeped out, and in nothing short of a little senior session miracle we were able to shoot at the Historic Cocoa Beach Pier! Just one week later another storm would come along and blow the roof right off of the pier building! I absolutely loved shooting with Maliah and she and her sweet mom Givana had planned out every last detail for a perfectly styled shoot with jewelry, a blanket scene with throw pillows under the pier, and gorgeous outfits from Free People. In the end Maliah was so bright and beautiful that she easily outshone tropical storm Emily and her sunset senior shoot was so warm and golden and perfect! Check out these images from our time together! Do you want to break out of the studio senior photo routine? Well you don't have to sit on a stool in a dark room in an awkward pose- you can style a custom shoot to capture this unique time in your life! For more information, or to book your 2018 senior portrait session, visit us HERE.